Recently Anna wrote on her blog, livinginaurora.ca, about drivers failing to stop at stop signs. She inquired with readers if she should whip out her camera and start photographing the culprits who fail to adhere to the rules of the road by blowing through stop signs. One of my pet peeves are drivers who fail to remotely adhere to the stop line at a STOP sign or traffic light. Just last week I was walking south on the east side of Yonge Street near the entrance to Enzo's No Frills and the South Hill Shopping Centre. Rolling out of the South Hill plaza at the traffic light was a white Wolseley Canada company truck trying to make a right hand turn to head northbound on Yonge Street. The driver failed to stop in time for the stop line and rolled to a stop across the two painted lines delineating the pedestrian crossing. I walked around the back of the truck and finished crossing southwards. 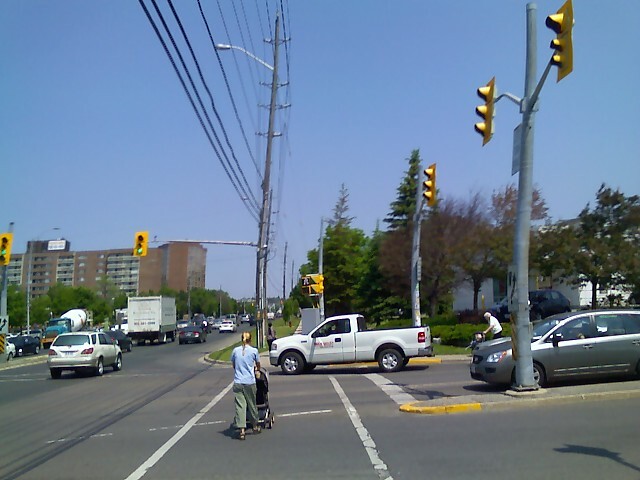 However, northbound in the intersection was a lady walking across while pushing a stroller. She had to carefully manoeuvre her way around the truck while the idiot Wolseley driver nonchalently watched the steady traffic on Yonge Street pass him by. I was incencensed that yet another driver drifted their way into the pedestrian area and failed to even acknowledge that others were there and the car was in the way. I whipped out my phone and took a photo of the offender. Richmond Hill and Aurora are seeing significant growth in the past two decades and this growth is expected to continue at least over the next two decades. The Region of York is encouraging intensification and transit use throughout the area which will only increase pedestrian activity. The police need to start enforcing the stop lines and obstructing pedestrian crossings. If the police fail to do this than why should the Region and local municipalities use significant money in painting these lines on a yearly basis? Perhaps if enforcement were properly undertaken, then the dumb looks of the offending drivers of "what the heck is going on?" as I walk across the street in front of the car might end as these idiot drivers would have been well informed by a nice yellow ticket by authored by York Region's finest. Pedestrians can only hope, until then, like Anna I will be using my weapon to take photos of idiot drivers blocking the duly painted right away of pedestrians. We have the same problems out here. I was out for a walk this morning before sitting down here to make my morning internet rounds (e.g. blog comments, e-mail, etc.). While on my walk along Yonge Street in Richmond Hill I passed over at least three intersections. At each one (2 stop signs 1 traffic light) I had to do the pedestrian negotiation of which way to go around these idiots. Well, having been in New York City I do have a little more gumption than most people. I imagine this would be the same for Jack in California as well. I walked around the front of 2 out of three of the cars. While at the front of the car I usually like to slow down a little bit and take the extra bit of time to ensure I can safely cross the road...er...slow down the drivers that is from making that all important right hand turn that they insist on blocking the pedestrian path. Oh...and in case you are wondering. Only one of the drivers I walked in front of gave me the shocked look that there is a pedestrian crossing the street in front of their car. The look is similar to seeing someone from Mars landing on their windshield.